An autistic super-genius teenager is on track for Nobel Prize. As a young child, Jacob Barnett was diagnosed with Aspergers Syndrome. Jacob's mother, Kristine Barnett, brought Jacob to the doctor after she was told that he wouldn't be able to learn anything in school. The doctor explained that Jacob would be able to learn simple things like how to tie his shoes, but little more. This devastating prognosis might have led to a future of special education and dramatically lowered expectations of Jacob's future potential, but Kristine had noticed that Jacob had memorized every street on the way to the doctor's office, and on the return trip. And that was only the beginning. IN A SINGLE WEEK, HE TAUGHT HIMSELF ALGEBRA, GEOMETRY, TRIGONOMETRY, AND CALCULUS Jacob's astounding memory allowed him to memorize all of the high school math curricula in just two weeks. As a result, he was able to attend university classes when most kids are still learning the basics of algebra, and now Jacob is a respected Master's student working towards a Ph.D. In quantum physics. Even more, the prodigious academic works with other university students, tutoring them on his own time after class. His mother, once deeply concerned that Jacob's prospects for the future, now jokes, “I flunked math. 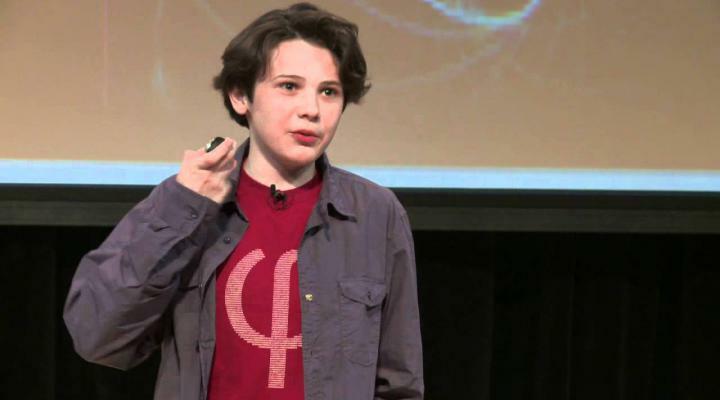 I know this did not come from me.” Not limited to the halls of academia, Jacob was a guest speaker at the 2013 TEDxTeen Talk, where he delivered an astonishing talk entitled, "Forget What You Know." In a field of speakers ranging from Nobel Prize laureates, academics with decades of experience, and business leaders, Jacob's talk has since gone on to be the third most popular TEDx Talk overall. FORGET WHAT YOU KNOW With an IQ above 170 - higher than even Einstein's estimated IQ - Jacob has been well ahead of the curve in any discipline, he sets his mind to. In a single week, he taught himself algebra, geometry, trigonometry, and calculus. Shocked university professors have watched Jacob take on some of the most challenging concepts in advanced mathematics. Jacob's affinity for numbers and the rules that govern them brought him to Purdue University at the age of 9, where he worked on Einstein's Theory of Relativity. Later, at Princeton, Professor Scott Tremaine commented, “The theory that [Jacob] is working on involves several of the toughest problems in astrophysics and theoretical physics…Anyone who solves these will be in line for a Nobel Prize.” It's clear now that Jacob Barnett has a bright future. Much brighter than one might have expected if his mother had taken his early school teachers and his doctor at face value. Jacob is growing into a charming, thoughtful young man with tremendous potential, even if he is a little slow to tie his shoes.